We back! 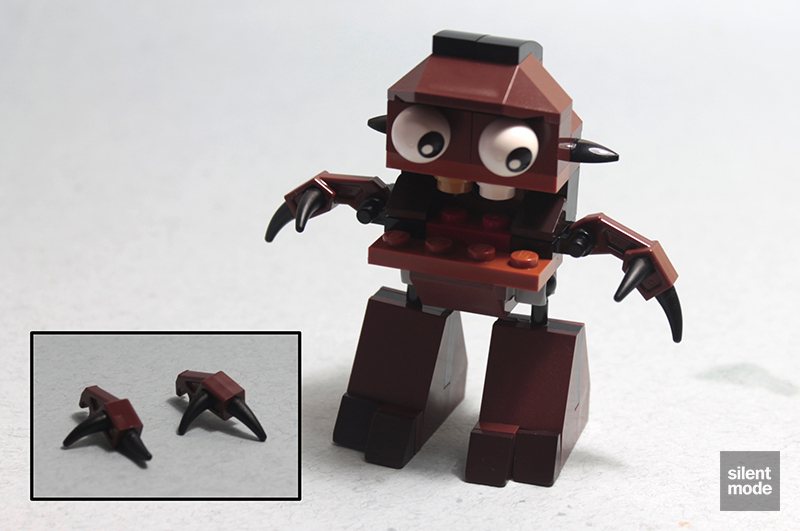 And this time we’re moving on to the second tribe in Mixels Series 2, starting with the crazy looking Chomly. First impressions are that this is going to be an underwhelming set, based on the build shown on the front. The cartoon character doesn’t look too appealing either. However, we always put our preconceptions to the side here on SilentMode.tv, so we’ll proceed. Now some of you might have assumed, if you’re familiar with Pokémon, that the brown Mixels are earth/ground/mud types, compared to the others we’ve seen so far. What was surprising was the name of this particular tribe: the Fang Gang. 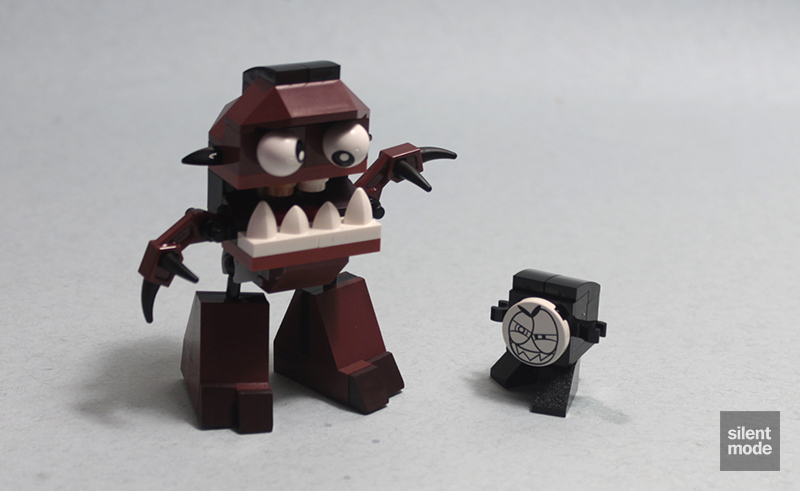 Then it dawned on me: the distinctive feature with all three Mixels in this tribe is big mouths. 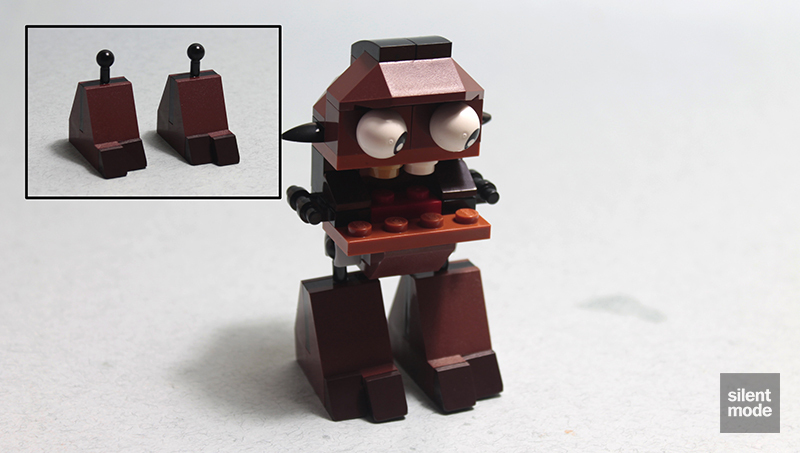 That could be read into in different ways, considering the Mixels are brown in this case, but I’m going to leave that alone – the people who designed these know what their intentions were, and that’s that. The Fang Gang makes use of Reddish Brown, Dark Brown and Dark Orange elements, as well as the Stone Grey, Black and White staples. Chomly comes with seven Dark Brown cheese slopes – great for hoarders of cheese slopes – as well as a few of those rather scarce Dark Orange plates, and two 1×1 Dark Orange SNOT bricks. It also makes use of two printed White balls and two of the new tooth plates, in true Mixels style. The two Black diagonal corner bricks go into constructing the familiar core of this Mixel. Just before we add a pair of crazy eyes to this thing, here’s what you should have. 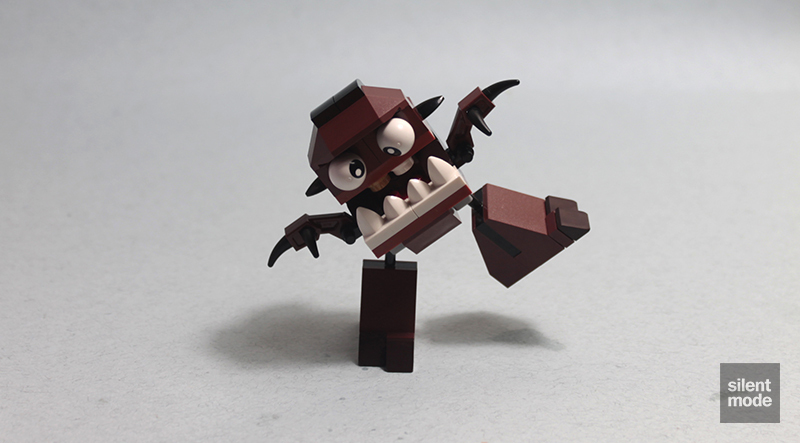 The solid construction means that Chomly is the only Mixel of the three in this tribe that can’t open and close its mouth. It’s just as well, since it has a valuable Pearl Gold tooth! The eyes are placed using Technic half pins, and while they can be positioned without having them roll around uncontrollably, it’s near impossible to make this Mixel look sane. We recognise these legs, don’t we? Well, Chomly gets them both. Then it gets a pair of menacing looking arms, helped in their menacity by the Black horn parts attached to them. Although they could simply be used to represent fingers, they could do some damage. Chomly goes nuts if we forget to give it its teeth: as you can see it was doing its rendition of the New Zealand rugby team thing. You’ll also be glad to know that Chomly comes with this tribe’s antagonising Nixel, which has a design we’ve seen before with Teslo‘s Nixel. Since Chumlo doesn’t have full use of its mouth, it’s trying to stomp the little sucker into oblivion. 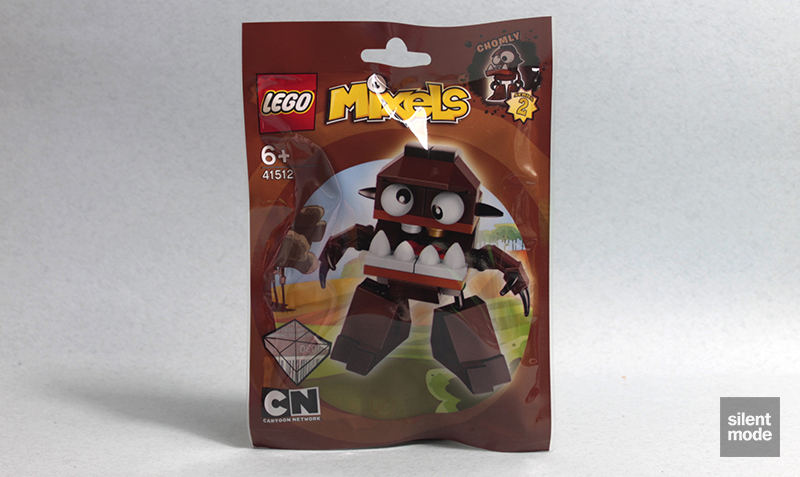 Keep your hands and feet away from the jaws of CHOMLY, because this lazy, trash-compacting Mixel will try to crunch just about anything. This habit cost CHOMLY a tooth once and now its smile has a golden gleam. A member of the Fang Gang, the tribe with the biggest appetite, this close-talking Mixel has very bad breath. So you wouldn’t want to be stuck next to CHOMLY at a Fang Gang food party, but that stinking breath comes in very handy for repelling Nixels! 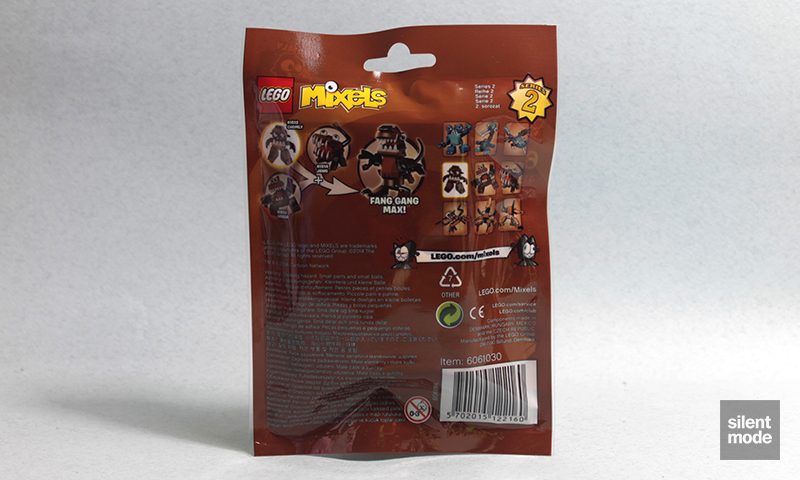 We can provide a description this time, which is available on the LEGO Mixels website, though it’s not the most intuitive page to find. Shout out to @ScottBarnick for pointing it out. The inclusion of the Nixel gives us six leftover parts: probably the most useful for me is the Reddish Brown 1×1 plate. 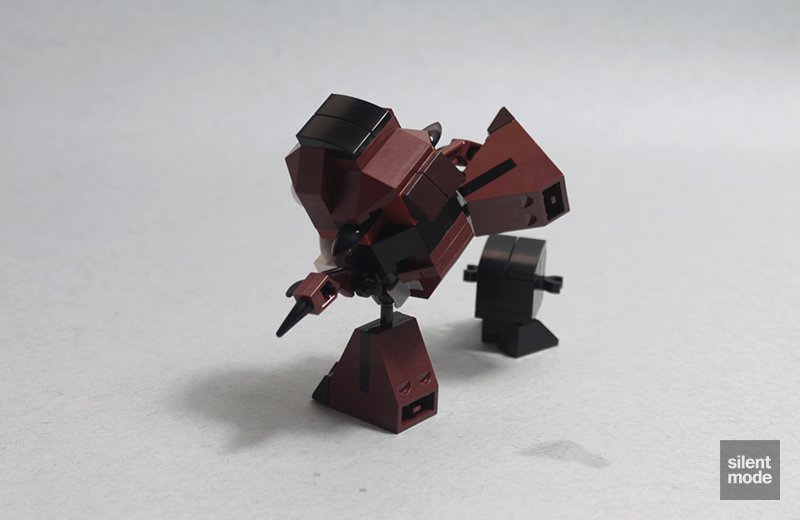 Although Chomla’s limbs only have one point of articulation each, they’re enough to make this Mixel playable with. There are also a few good parts in the set, particularly for those after Reddish Brown parts (and perhaps the Dark Orange SNOT bricks). For me, this is the least interesting Mixel in this tribe because of its lack of mouth articulation – though it will have its fans – and would only get it to complete the series. I’m going to give this one 6.0/10.